You are definitely a vendor I can recommend!!!!!!!!!!!! Very many thanks to D3D (and Daz) for the update for GenX. I tried using the capability of picking up the morphs from an existing figure as per the instructions. I was trying to transfer across the Clown Clan jester head with an extreme expression on it and the result was a bit of a mess. Is this a too extreme case to be able to convert? Quick silly question, do I install GenX in DAZ Studio or with Genesis? It's a Plug in, so in the Application's folder. I've got a question too. Rather an off the wall one. Over on Rendo Ironman13 has a couple of morph packs for V4 that are Poser only (one of them uses Poser magnets, I don't know about the other). Is there any way to get those morphs into Studio and translated to Genesis? I do have a copy of Poser, no idea of how to use it, but it ought to be possible to load a clean copy of V4 and whatever morphs are required (probably Morphs++), inject the morph pack and do the magnets and save it. But would the modified figure even translate? Is there some way to save it that would cross over into Studio so GenX can get at it? ETA: The 2nd pack uses PMDs. Evidently Studio doesn't recognize those the way Poser does. But what about the add-on packs? luxgabu: I would need a side by side image of the original morph and the transferred morph to get an idea what might have gone wrong. Please note that the new feature only gets the morph values from the figure in the scene. 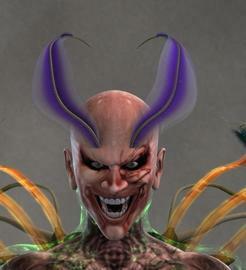 You still have to inject morphs (like the custom head morph from Clown Clan) into GenX directly by using the INJ pose. BurstAngel: GenX is a plugin for DAZ Studio. The GenX installer should propose the correct installation path (where DS is installed). JOdel: GenX transfers morphs only, no magnets. I have not much experience with Poser magnets in DS, but it's possible to load them directly in DS. To transfer magnets for V4 to Genesis, it would be possible to convert the magnets to morphs in Poser (e.g. with my free Spawn FBM script), then transfer them with GenX. But this might be some work, in particular if the magnets are controlled by the pose. JOdel: GenX doesn't support PMD morph injections. You may inject the morphs in Poser, then save the figure with the injected morphs as a new CR2 that can be loaded by GenX. BurstAngel: The Gen3 add-ons would still work with the new version of GenX, but they have been updated as well to support the improved morph transfer. I have no official confirmation yet, but the readme page for DSF Toolbox is live and claims that the product has been updated for DS 4.5, so I guess the new version will be available for download as well. 1. Option to create files in DS 4.0 or DS 4.5 file format. 2. Support of compressed DSF / DUF files (when reading and writing files). 3. New tab to (de)compress DSF and DUF files. This allows to change compression quickly for single files (e.g. to edit them in a text editor) or whole folders (e.g. to save disk space). Just reset before bed here, I can confirm it's updated! YAY!!! Ah, I see... DAZ is finally getting around to using zips for Win & Mac together. Even better! Download the 4.5 file zip. It's all in there. Thank you!! Sometimes it gets confusing. Love this plugin! Very excited bout the prospects of your products. If I purchase GenerationX.and the Genesis Generation 3 Add on bundle, could I use head morph sets (like that available from Predatron) to add new head morphs to M3 and then apply those new morphs to Genesis? And if so, could these morphs be applied/blended with any Genesis figure or if Predatron's morphs were for M3, could they only be applied to a Genesis figure set to its M3 morph? Will this work in conjunction with Texture Converter 2? Will this work in Carrara 8.5? GenX may transfer any morph from one of the supported figures to Genesis. So, with the M3 add-on for GenX and the M3 base shape for Genesis, you can have any shape for M3 also on Genesis. Because the morphs are transferred relative to the shape of the original figure, the morph only has the same shape when Genesis was morphed to the shape of that original figure before. Of course, you can nonetheless blend the morphs with any other Genesis morphs, however results may vary. GenX doesn't have anything to do with textures. So if you get a texture to Genesis with TC2, you can use it with morphs transferred by GenX. I don't know if or how well Genesis works with Carrara 8.5. GenX creates regular morphs for Genesis, so you can use them with any application that supports Genesis and its morphs. If I were to be involved in the PA sale, I should know, so I think I'm not. I am obviously doing something wrong, but what? I think on Genesis you should turn off the base male morph. When I use the V4 morphs I've converted, I only need to dial up the V4 genesis figure. Look for the jesterhead only dial. I get that when i use custom head morphs. And when i use it for V4, it's the same for me as riftwitch, I only access the victoria 4 dial and leave the female one alone. Huh. That might be worth it. It's a nice package that gives the figure nice visible knuckles, and bones in the hands and feet. Would like to get that into a dial in Studio. The other package with the magnets is probably a dead loss, unless one can save the that modified figure as a cr2 from Poser. luxgabu: If hardly anything changes, either some morphs were not loaded correctly into GenX, or some values were not set. After loading and applying everything into GenX, use the morph list to verify all morphs are loaded, selected, and have the correct value. Thank you for the update for the DSF Toolbox. Flagged them. But that first is only for Windows. I use a Mac. The MorphExchange tool, while stating it is for Windows is actually a Java jar file, which will start on Mac OS X. Just double click the JAR file (coffee cup icon) within the extracted directory. Tested on Mac OS X 10.7.4 Lion. Before I buy it, let me ask: now that it's been updated, I assume GenX cannot be used in DS 4.0 any more? When I reset my download for GenX, I am getting the files for DS4 and for DS4.5.